One of the most widely used landscape ornamental trees in North America, the Norway spruce (Picea abies) grows to a height of 80 feet with a spread of up to 40 feet. There are approximately 120 cultivars of the tree, according to Floridata. The tree grows best and enjoys the longest lifespan in U.S. Department of Agriculture hardiness zones 2 to 7 and can tolerate a wide range of conditions. The Norway spruce is native to northern and central Europe. In its northeastern range in Europe, the tree has undergone hybridisation with several other species. It was brought into the United States for use as an ornamental landscape tree. In a few areas it has escaped cultivation and grows on adjacent lots, but it is not considered to be invasive. In Great Britain and North America, the Norway Spruce is a favorite cut Christmas tree each year. Whether growing in its native habitat or as an ornamental tree elsewhere, the Norway spruce rarely exceeds a lifespan of 220 years, according to the Muhlenberg College. Widely planted as a specimen tree, the Norway spruce grows well in a variety of conditions and enjoys a long lifespan in numerous types of landscape. It tolerates a range of soil types but prefers that soild is well-draining, in a slightly acidic pH range. The tree performs best in a full-sun location, but it can grow in partial shade. It does require abundant water and prefers moist soil for adequate growth. Once established, the tree is only moderately drought tolerant. A severe drought can easily shorten the lifespan or kill the Norway spruce. Within the Bavarian forest of Germany, the oldest living Norway spruce tree is believed to have grown. The tree was reported to be 468 years old, according to Gymnosperm Database. 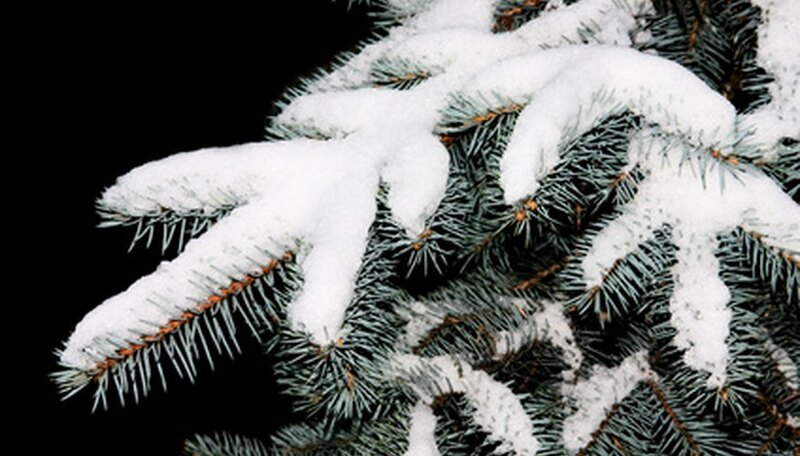 The Norway spruce species has existed as far back as the Ice Age. The cycles of climatic changes have spurred the tree to adapt over the centuries to endure and survive in extremely harsh climates. Over the tree's lifespan it grows into a large pyramidal shape. As the tree ages, the upper canopy becomes flat and slightly irregular. A monoecious tree, the Norway spruce has the capability of self-pollination by producing both male and female flowers, according to the Ohio Department of Natural Resources. The cones are symmetrical in appearance and measure approximately 7 inches in length Throughout the tree's life it develops scaly bark that becomes more speckled with resin that often drips down the trunk. Cytospora canker, a disease caused by the fungus Cytospora kunzei, afflicts Norway spruce trees that are older then 15 or 20 years. The tree's lower limbs show the first signs of disease: needles turn brown and fall from the tree. Over the course of several years, the disease progresses upward, affecting more limbs. Although the disease rarely kills the tree, it does weaken it, which results in a shorter lifespan. Infected branches cannot be saved. Copper-based fungicides help prevent the infection but do not cure it. A tree that is infected should receive adequate water and fertilizer to help strengthen it to combat the disease.